Home testing for fertility prediction : "Women are being offered a new test kit that allows them to predict the rate at which their fertility is declining.The test works by measuring the number of eggs in a woman's ovaries and indicating what that level might be like in two years time." There is no question that practising medicine can be very fulfilling for the doctor. However, many patients mistrust their doctors , because they are worried that the doctor's advise is tainted by the fact that he needs to earn money based on what he tells them to do. Sadly , it is often true that patients are subjected to unnecessary surgery - and a prime example of this would be the epidemic of bypass surgery we are seeing. Unforunately, healthcare has become a huge industry, and many doctors are unwitting pawns in the hands of pharmaceutical companies and corporate hospitals, whose bottom line is their bottom line ! It would be perfect if you could find a doctor who was independently wealthy - one who practised medicine for the fun of it - not as a source of income ! Be careful about reading health books. You may die of a misprint ! Our fertility calculator is much more accurate ! Originally uploaded by Dr Malpani. 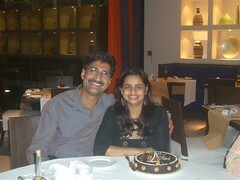 Celebrating Anjali's birthday. It's always a holiday - she was born on India's Republic Day !
" Faith healers fall into the same category as psychics and fortunetellers. Some hard-hitting common sense advise - which is well worth repeating - " The Wisdom of the Crowds" strikes again ! However, just because everyone believes that it works doesn't make it true either - you still need to use your own judgment. The crowds are often wrong . The book, "Extraordinary Popular Delusions and The Madness of Crowds" is a useful reminder of the dangers of uncritically following the bandwagon. E-prescribing: "E-Prescribing Cuts Costs, Improves Patient Safety. With perhaps two-thirds of all physician office visits resulting in the doctor writing a prescription, electronic prescribing should be an essential part of any practice's IT strategy, practice management advocates and government officials say." Is this going to be the killer app ? It's great , especially for routine "refills". Wired for Health - Young People:A series of 4 websites from the UK government, tailored to meet the needs of children of varying age groups. Educational and entertaining ! What do patients expect from their doctors ? Patients' Exectations: "Patients want their physicians to like them. Since there is a tendency for patients to think that physicians will do more for those they care about, patients generally equate a provider's liking them and being interested in them as individuals with better care overall. The idea is that physicians who like you will bring their best efforts to bear on your behalf." I run a busy and successful IVF clinic. We ( Dr Anjali and I) do about 300 IVF cycles every year, and know all our patients by name, since we take care of all of them ourselves - we don't have any assistants. A lot of people ask me - Why don't you expand ? Why don't you perform more IVF cycles ? I guess for most people, more cycles = more money = better clinic = happier doctor !I think this is flawed reasoning ! We have enough money to have a comfortable lifestyle; and to contribute back to society ( we run the world's largest free patient education library, HELP). While seeing more patients would increase our income, I don;t think it would increase our happiness. Many of my peers and colleagues think I am crazy, because they are doing their best to increase their workload, while we are trying to cut back on ours ! I was wondering if maybe I was mistaken, when I read the wise book by Dr Bernard Lown, Practising the Art while Mastering the Science. He writes, " We enjoy doctoring. Listening to patients consumes a good deal of our time. We are selective in application of technology. Invasive methods are used to a minimum. This type of practice may not be consonant with current concepts of sound economics, but it certainly provides good medical care for the patient, and immeasurable fulfillment for the physician. " Aaah - validation at last ! Someone else who thinks the way I do, even if he is half way across the world . This means I am not crazy - and maybe it's the other doctors around me who are ? Yes, I could increase my financial income by seeing more patients, but why would I want to lose my incomparable emotional income in order to do so ? Medicine - profession ? or business ? I always ask my patients about their experiences at other IVF clinics. This helps me to benchmark our practise; and to improve our standards. I am often astounded when they tell me that the medical history was taken by an assistant, and the "doctor" just breezed in to do an examination and provide advise regrading treatment. A medical history is a crucial part of the medical treatment , in my opinion, and must be done by the doctor. While it does not provide much medically useful information for most infertile patients, it's extremely valuable in helping the doctor to establish a rapport with the patient. After all, every patient is first a human being, with a unique set of problems and perspectives. A history is a conversation between my patient and me and allows me to get into my patient's skin, so I can do a better job treating them. Why would a good doctor want to delegate this to someone else ? Of course, having an assistant do this would help the doctor to see many more patients - and busier doctors earn more money. But medicine is not just a business - it's also a profession which should be satisfying and personally rewarding ! I love talking to may patients; unearthing their problems; and trying to solve them - why would I give away something I enjoy doing so much to someone else ? I enjoy doctoring ! Same diagnosis - different treatments ! One of my patients asked me, " Why would you offer two patients with exactly the same diagnosis completely different treatments ?" She was referring to the fact that both she and her sister were infertile, and had come to me for advise. I had advised her sister to continue trying on her own; while I had advised her to do IVF. Medically, both of them were completely normal - their husbands had good sperm counts; they were ovulating; and their uterus and tubes were normal. They had what we call "unexplained infertility", where we cannot find a diagnosis to explain the infertility. She was perplexed why my advise to her sister and her were so dramatically different. at a premium for her because of her age - she could not afford to waste it. Her sister was much younger, and had just started trying, so there was no need for me to be so aggressive for her. Even if there hadn't been such a difference in their ages, it is true that I do tailor my advise depending upon my patient's particular situation - not just their medical diagnosis. Thus, if a couple lives in Bombay, I am happy to try IUI ( intrauterine insemination) treatments, even though they have a lower pregnancy rates than IVF ( in vitro fertilisation) , because we have the luxury of time. On the other hand, if a could comes to me from Lucknow, then doing IVF is much more cost effective, because it maximises the chances of conceiving quickly. I also try to request my patients to provide their input when formulating a treatment plan for them. I remind them that I cannot read their mind - and it's their responsibility to help me to come up with a plan which they are happy with ! I treat patients, not numbers ! As an IVF specialist, I often see older women who are worried about their fertility. A woman's fertility declines with her age because her ovarian function deteriorates with time; and a useful blood test for assessing the quality of the eggs is the FSH level ( a blood test for measuring the level of the Follicle Stimulating Hormone) in the blood. Women with poor egg quality have high FSH levels, and most doctors are unwilling to treat women with FSH levels of more than 12 because they have a lower chance of getting pregnant. Older women with a high FSH will often ask me for advise, and I tell them I have happy to do IVF for them, even if their chances are poor. I tell them we don't have an arbitrary "cut-off" - after all, we don't treat numbers, we treat patients ! As long as she understands her chances are poor, and still wants to go ahead with the IVF cycle, I am happy to do this for her, provided she has realistic expectations. This way, she achieves emotional closure and resolution - and peace of mind she tried her best, even if she didn't get pregnant. Why don't doctors listen - the patient's lament !
" There are in fact many reasons why physicians do not listen well. Most relate to deeply imbedded myths within the profession that interrupt listening. One example is the myth that medicine is an art and a science. With this split firmly in place, what is considered ‘science’ becomes funded and taught and what is labeled ‘art’ is often given scant attention. A good example of this is auscultation. Considered science, students are trained to use their stethoscopes for listening to internal organs. They learn for example to identify abnormal from normal heart sounds as well as what to do when they hear an abnormality. When listening to the person (versus the organ) most physicians function as amateurs not knowing what to listen for nor how to respond appropriately. As a consequence, vital communication clues tend to be missed as are opportunities for healing." This is a very insightful comment by Dr Barry Bub, in the Healthcare Communication Review. It's sad that medical students spend more time learning how to listen to heart murmurs through their stethoscopes, than how to truly listen to patients with their ears ( and their eyes for non-verbal clues). Good doctors have excellent people ( soft) skills - but these are not taught in medical school. They are either born with them, or learn them by "osmosis" by watching good doctors, who serve as role models. ABCs of Patient Safety Very clever ! Pfizer Clear Health CommunicationUnderstanding health information is everyone's right. For patients, it means being able to follow instructions from a doctor, nurse or pharmacist; manage a chronic illness; and/or take medication properly. For health care practitioners, it is about helping patients understand and act on health care information. Millions of patients encounter difficulties when they try to understand health information — which in turn has a negative impact on health outcomes and the entire health care system. As a result, Pfizer has taken a leadership role in advocating for Clear Health Communication. All health care information providers have a responsibility to ensure that the information given to patients is communicated in a way that is understandable and truly accessible. Getting the Most from a Visit to the Doctor: "All of us go to the doctor at one time or another. Considering how important these visits can be, it is surprising that we don't get any training for them. Visits often just seem to happen, and afterwards we find ourselves saying, 'Oh! I forgot to ask about...! I wonder what the doctor meant by…!” Knowing what we want out of a visit, preparing for it, and following some simple steps can help us get the most out of our visits." No One Dies Alone: "No One Dies Alone. No One Dies Alone is a volunteer program at Sacred Heart that provides the reassuring presence of a volunteer companion to dying patients who would otherwise be alone. With the support of the nursing staff, companions are thus able to help provide patients with that most valuable of human gifts: a dignified death." This is a program all hospitals can emulate ! Have you got a bad doctor ? Have you got a bad doctor: "Have you got a bad doctor, nurse, PA, nurse practitioner, tech, aide, or some other professional? This is a note to help you improve your healthcare practice. I find you to be a talented, capable and intelligent clinician. You provide good healthcare. However, your bedside manner needs development. The quality of the technical care you provide is sometimes lost because you do not show that you care about me, and my life. I respectfully request that you take time to look at your behaviors. When you do, you will see that your patients need your compassion, with respect and humility, as much as they need your expertise. If you need more direction, an excellent resource is Love Your Patients!, a book by Dr. Scott Diering, as well as his website, www.loveyourpatients.org. I hope you continue to improve the style with which provide your care. I wish more patients would provide feedback to their doctors ! How will doctors improve unless patients tell them what they are doing wrong ? Five Ways to Satsify Patients in Less Time: "Put it in writing. For your patients who read, putting the simplest of instructions in writing enhances the likelihood that they will follow through on your advice. And you and your staff will save time spent on post-visit telephone calls, e.g. “What did Dr. Moore tell my husband he was supposed to do?”"
My preferred mode of communication with my patients is email. This way, everything is in writing, so the scope for errors and misunderstandings is much less. This is especially important when patients are flying to Bombay all the way from New York or London for IVF treatment ! Why doctors and patients are worlds apart: "Popper's model of worlds 1, 2, and 3 provides a way to understand differences in physician-patient expectations. According to Popper, world 1 is the world of material objects, world 2 is the inner world of each individual's private thoughts, experiences, and beliefs, and world 3 is the world of concepts, theories, and objective knowledge. As Little points out, clinicians and patients are often worlds apart. Patients, who experience illness in a personal way in world 2, are expected to present and discuss their medical problems in worlds 1 or 3. 'Yet clinicians will try to objectify symptoms, questioning patients about their attributes -- severity, site, radiation, periodicity, and relief. Clinicians examine the (patient's) personal experience as a semi-concrete object in world 1 with criteria and rules and theories evolved in world 3.'" Healthcare Collaborator: : "All patients want to be treated by caring, compassionate providers who are there for them and listen to them, especially when they're ill, distressed, or afraid. Individual expectations may be more difficult to identify. While some patients are quite forthcoming about their expectations, others need help opening up." This article discusses ways doctors can communicate with patients, not only to uncover their expectations, but to decipher hidden meanings behind what people say. " Healthcare Communication Project: "Become an active partner in your own healthcare. Learn how to advocate for yourself and others by forming collaborative relationships with doctors and other healthcare professionals." Excellent source of some very well-written articles on how to improve your ability to talk to your doctor ! Love Your Patients! : "Love Your Patients! refers to a simple yet powerful way of improving patient satisfaction, decreasing litigation risks and making life better. " Such a simple message - but one which is worth repeating. This is a book I feel all doctors ( and nurses) should read ! good ! These are often "heartsink" patients, because they are so frustrated and confused. For these patients, I have found that the best treatment is - Information Therapy ! I advise them to read the book, Coming to Term. This is one of the wisest books I have ever read. It is written by a skilled author, who is not only a scientist, but who has also experienced the trauma of multiple miscarriages firsthand. In fact, getting patients to read books written by other patients is excellent medicine. Not only do they realise they are not alone; they can also derive strength and courage from another fellow-patient's experiences. I feel doctors ( and medical students) should read these books too ! These books help to humanise medicine, as they give a personal face to illness and suffering. Infertility treatment is always elective - and couples need to make difficult choices, because they have so many treatment options. IUI ? IVF ? adoption ? donor egg ? There are no "right" or "wrong" answers, and each couple needs to find their own right answer for themselves. They often ask me to decide for themselves, and I refuse to do this. I explain to them that they need to live with the consequences of their decisions, which is why it is important they decide for themselves - so they have peace of mind they did their best. I feel that an important role a doctor can play in this process is giving patients permission to decide for themselves - and encouraging them to do so, by acting as a non-judgmental sounding board. When they tell me what they have decided, I reassure my patients that their decision ( no matter what it is) is the right decision . Hearing this validation from their doctor ( an "authority" figure) gives patients considerable peace of mind that they have taken the right decision - and this makes it much easier for them to come to terms with themselves and their illness. I understand it may not be easy for some doctors to do this. Many doctors are highly opinionated, and have strong feelings as to what is "right " or "wrong". However, being non-judgmental, and supporting the patient's choice, are key skills all doctors need to learn. As an infertility specialist, I understand how difficult it is for my patients to cope with the stress of infertility. I have found that a sense of humour helps people cope with stress much better, which is why I advise my patients to watch a film, called Maybe Baby. This is a romantic comedy, which describes the travails an infertile couple goes through in their quest for a baby. I know it's unusual for a doctor to "prescribe " that his patients watch a film, but I have found that watching the film helps infertile couples to relate to each other . They can empathise with the couple in the film - and can also understand each other's feelings far better ! Clear Passage Therapy - taking infertile patients for a ride ! One of the most seductive websites for infertile patients today is the Clear Passage Therapy website, which offers infertile women a “natural” way of getting pregnant. If I were infertile, and if I were not an infertility specialist, I am sure I would get taken for a ride by this site too. Let’s look at their claims a little more closely, and see why they are so useless. The number of things they claim to achieve by simply massaging the pelvic organs is incredible – and amazing. Not only do they claim to cause adhesions to “melt” away by breaking them; they also believe that massage will help to improve ovarian function by reducing FSH levels by improving blood flow. This is all rubbish ! Let’s look at adhesions first. Adhesions are made of fibrous scar tissue. They form during healing, and once they are formed, the only way of getting rid of them is to remove them surgically. In fact, often this surgery is also not helpful, because these adhesions will reform again. How anyone can even imagine that massage could selectively cause the fibrous scar tissue to “melt away” without also tearing and damaging the normal organs is beyond my imagination ! Similarly, there is no way to increase blood flow to internal organs by simply massaging them ! If one could do so, then doctors could bypass bypass surgery by referring patients with angina and heart attacks for massage therapy, to improve blood flow to the heart as well ! I must admit the Clear Passage owners are very smart – they have cleverly chosen to focus on infertile patients. This is a heterogenous population , and we all know that many patients with unexplained infertility will conceive no matter what you do. Of course, if you happen to treat them with Clear Passage, then you can claim that the pregnancy was a result of your treatment – and this patient then becomes one of your “success stories” ! If you treat enough patients, you will have many successes – often not because of your treatment, but inspite of it ! This is also a clever technique , because it is “hands on”. Patients feel good about it because they feel that something concrete is being done, which they can actually see - and feel ! Moreover, because it is non-surgical and inexpensive, it is also very appealing ! What amazes me is why such few doctors have raised objections to these ridiculous claims ! Perhaps most doctors just acknowledge that this is ineffective treatment, and feel that the best option is to ignore it. And if patients choose to waste their money, why should their doctors stop them ? Cleverly, CPT has now positioned itself as an adjunct to IVF treatment, by claiming that Clear Passage Therapy helps to improve IVF pregnancy rates too ! Patients who are spending thousands of dollars on IVF are quite willing to spend a little more on CPT if it will increase their chances even a little bit ! However, the reasoning is completely incorrect . The so-called medical studies which they tout, which they have published in “ medical journals “ ( an online low impact journal called Medscape General Medicine) are fatally flawed. None of these are prospective randomized studies ! They just compare IVF pregnancy rates in women who did IVF in the past without CPT; and are now doing IVF again after doing CPT. The apparent improvement in pregnancy rates could simply be because they selected a better IVF clinic the second time around – or the doctor modified their treatment, based on the results of the first failed IVF cycle. However, by quoting statistics, they know they have won the battle, because most patients are simply not sophisticated enough to analyse the numbers or even to try to make sense of them. They believe that if they are quoting “ statistics”; and if the studies have been “medical studies” published in “ medical journals” , the stuff must be valid and reliable. There is no question that “alternative medicine” is becoming increasingly popular in the US. CPT has cleverly got on the bandwagon, and added a new wrinkly by “patenting” their technique of massage, by adding a generous helping of technical terms ( most of which are hocus-pocus) to their description of what they do. I quote, “ site-specific manual soft-tissue therapy improves soft-tissue mobility, elasticity, and distensibility. Theoretically, mobilization of the soft tissue may break collagenous cross-links and adhesions that cause pain and dysfunction, including physician-diagnosed mechanical infertility.” Lots of gobbledygook and jargon, full of sound and fury, signifying nothing ! I must also admire their clever selection of a very evocative name – “Clear Passage” , which suggests that the massage clears the passage of the eggs and sperm through the tube ! I was very intrigued by the fact that they claim to have a patent pending for their technique ( after all, what could be patentable about massage therapy, which has been practiced for centuries all over the world ?) They claim that their “ non-surgical therapy is so unique that we have been granted US patent protection” . I did a search at the United States Patent and Trademark Office website website for Wurn or “clear passage” – and came up with – zip ! Are they lying ? The problem with Clear Passage is that they are using clever marketing tools to take advantage of vulnerable patients. By making them waste time and money , and raising false hopes, they are doing the infertile community a disservice. Why Health Professionals Become Quacks: " Psychologists, physicians, actors, or others who become health gurus often become darlings of the popular press." Facinating insights into the mind of "professional " quacks ! Society has traditionally spent millions on educating doctors and nurses so they can learn to take better care of patients. While this is important, I feel it is equally important that we shoud be spending money on educating patients, so they can learn to be better patients ! In fact, I feel CME ( continuing medical education) programs are of little value. Good doctors will keep themselves updated and will always practise medicine competently and efficiently. Bad doctors, on the other hand, will never improve, no matter what we do. This is why I feel that a lot of money spent on re-educating doctors would be better spent on educating patients ! Unfortunately, patient education seems to be no one's baby, as a result of which it is a releatively neglected area. This is a shame, because the potential cost-benefit ratio is huge ! For the investment of a small amount of money, it's possible to improve the healthcare millions of patients receive. We can teach patients how to talk to doctors; how to judge the quality of the care they are receiving; and how to get a second opinion. The tools to do this are easily available - they just need to be used more widely and effectively ! Patient education resource centers and libraries should be an integral part of all hospitals and clinics - even if it is only an internet terminal with a nurse or librarian to help patients make sense of the information they unearth. This is one of the reason why we run HELP. I feel patients represent healthcare's largest resource - and they have been untapped so far. If we can make intelligent use of patients, and help them to make use of their intelligence, everyone will benefit ! MedSelfEd Patient Education: PreOp.com Have you or a friend been advised to undergo surgery ? Are you still unclear about what your doctor is proposing to do ? Are you worried about what might happen ? Here's an excellent site to educate yourself about the details of all the common surgical procedures, explained very cleverly with the help of animations. " Everything you wanted to know about your operation - but were afraid to ask your doctor, because he was too busy !" Not only is the site very comprehensive and comprehensible, it's got lots of information on what you need to do before the surgry - and afterwards as well ! IDR MedCLIK Digital Drug ReferenceHere's a very valuable resource for all patients in India. It lists all the drugs available in India, along with their generic names and the prices ! Building a Health Service fit for the Future" Recent work on how wider trends in society and customer experiences in other sectors might impact on the healthcare sector suggests that in 20 years time, patients may be very different. • want more control and more choice – they will reject ‘one size fits all’ services." As patients become more demanding, will doctors adapt to fulfill their needs ? Journalists and the stem cell fiasco: "Yes, this monumental scientific fraud was not initially disclosed by the journals that published Hwang's cloning and stem cell papers, or the reviewers, or regulators, or ethics committees--all those scientific institutions that should be bulwarks against fraud of this magnitude. Disclosure happened because reporters for the South Korean TV network MBC got a tip and pursued it vigorously." While it's true that journalists have been responsible for uncovering this fraud, let's not forget that they were responsible for creating the hype in the first place ! I find this fascinating. Exactly the same thing happened in India 3 years ago, when Reliance , India's largest private sector company, hogged the first page of the Times of India when they claimed they had established embryonic stem cell lines ! India was seen to be a world leader in cutting edge science - though the company refused to allow any verification of their claims. The only critical article was by the late Daniel Pearl, the famous journalist from the Wall Street Journal, who exposed their claims as being bogus. The Times of India continues to tom-tom stem cells as being the next revolution in healthcare - and the Health Minister is happy to feature prominently in the media by agreeing with these statements - many of which are highly irresponsible and unsupported ! * develop options for change WITH people, not FOR them, starting from the patient experience and engaging the public early on to develop solutions rather than have them respond to pre-determined plans conceived by the professionals. * view the NHS as a service delivered predominantly in local communities rather than in hospitals; 90% of health care is delivered in primary care but we still focus the bulk of our attention on the other 10% - our current emphasis on hospitals does not provide the care that people are likely to need. * become a modern NHS; using new technology to improve the standard and the speed of care, connect clinicians, involve patients in their own care and support the research vital to future wellbeing." Put the Patient First ! Indian Ingenuity: An Indian has developed this very clever product, which costs only about US $ 400 - a fraction of what other companies elsewhere in the world charge. I feel this will help to revolutonise the practise of medical histopathology and microscopy in the developing world. " The product is an indigenously engineered compact, sturdy and lightweight portable eyepiece with a built-in video, a projection system that enables visualization of microscopic structures on a computer/laptop that is connected to the microscope. Extensive R&D has helped in developing such a device that consist of a portable eyepiece at one end (to be connected to the microscope) and a wire cord at the other end (to be connected to the computer/laptop)." Check it out ! The Personal Health Technology Initiative is a major effort by the Markle Foundation Health Program to advocate for patient empowerment through personal health records and other health information technologies in the context of an emerging system of nationwide health information exchange. * Earns and keeps the public's trust"
I hope this helps to put patients back at the center of healthcare - where they rightfully belong ! * Many people find it easier to open up when not having to see someone face to face". I am glad people have started to realise that there are actually many benefits to online therapy versus realworld therapy ! Sometimes the bnefits of a real-world interaction are over-rated ! Music Therapy, and Using Music in Therapy: Freudian Slip: "Using music in therapy can be a very powerful way to reach children, adolescents, and adults in the therapeutic setting. Music in therapy can be a powerful way to help people express their feelings. Creative therapy can reach people in ways that traditional therapy sometimes cannot." My dream is to develop patient-centered tools on the web so that IT can be used for IT - Information Technology for Information Therapy ! If we can give patients the tools they need to manage their own health-related information ( for example, their own medical records), we can change the way the entire healthcare system works ! If we need to reform the healthcare ecosystem, we need to put patients at the center - I feel “ patients are the largest untapped healthcare resource “ ! My assumption is that patients ( or their relatives and friends) are : Intelligent and capable; and because they have a lot at stake , they are motivated to get good health care, and will be willing to invest time and energy if given the right tools to ensure a good outcome. Our job is to creat the right tools and then give them to the patients, so they can use them to regain control over their healthcare. Sound Advice — My Healthcare Advisor: "BUYING A HOME. Choosing a career. Getting married. Are there any decisions more important than these? What about choosing the best hospital?" To Find a Doctor, Mine the Data — My Healthcare Advisor: "Now that millions of consumers are surfing the Web to research their own medical symptoms, many are taking the next step: comparison-shopping online for hospitals and doctors." Health Information Technology (ONC): "The Benefits Health IT Can Bring to Our Nation – Fewer Mistakes, Lower Costs, Less Hassle, Better Care"
Connecting Americans to their Healthcare: "From iPods to online commerce to 'googling' to swapping digital photos via e-mail, information technology is revolutionizing our lives and allowing us to tailor what we see, read, hear, buy, and sell. Health care is no exception. Information technology (IT) is rapidly and radically changing how we experience health care in the United States. Health IT is enabling some patients to communicate better with their doctors, manage their own medical information, and improve the care they receive. Some hospitals, health plans, and medical practices are storing patient records, CT scans, and other medical images on computers, making them easier to find. Health IT is on the cusp of allowing patients and authorized physicians to gain timely access to personal health information through electronic health information exchange. Health IT will soon enable patients to learn about the quality of their doctors, hospitals, and other providers online. Much more change is on the way as health care is revolutionized by digital technology. "